Female mate choice can heavily influence the evolution of male sexual signals. While mate choice was once thought to be a consistent and stable behaviour, research has shown mate selection is often very dynamic and variable throughout a female’s life. There are a number of environmental and internal factors that can affect a female’s mate choice (Figure 1). For instance, a female suddenly in danger of encountering a predator may alter her final mate decision. A female’s past sexual experience and her age   can also play a role in determining her mate choice. We currently have a vague understanding of how and why various intrinsic factors, such as female age, can cause variation in mate preferences and what the overall effect is on the evolutionary direction of male sexual traits. Figure 1. Network of some of the intrinsic and extrinsic factors that could influence the final mate choice expressed before copulation; the interaction of these mate preference cues can drive sexual selection. In one of our studies, which was recently published in PeerJ, we examined how one of these factors, female age, influenced female mate preferences in the Jamaican field cricket, Gryllus assimilis. Research on other species including cockroaches (Nauphoeta cinerea)6 and guppies (Poecilia reticulate)5 has revealed that as females age, their health and likelihood of future reproduction progressively declines. Because of this, older females may be less choosy in selecting mates compared to younger females who have higher reproductive potential. Figure 2. 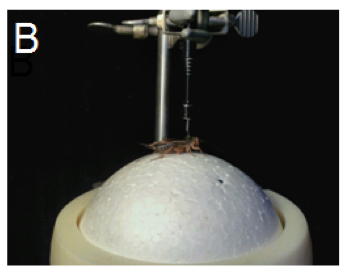 A) A cricket tethered on top of the sphere (part of trackball). An optical sensor picks up the movements made by the trackball, which is rotated by the cricket walking. This information is collected on a computer system. Figure 2. B) Female cricket tethered on top of our trackball via spring attached to magnet. In crickets and other acoustic insects, females find and assess the attractiveness of potential mates using acoustic signals produced by the males of their species (termed ‘phonotaxis’) . We tested a wide range of female ages and assessed female phonotactic response to a male acoustic mate attraction signal using a specially built apparatus called a trackball. 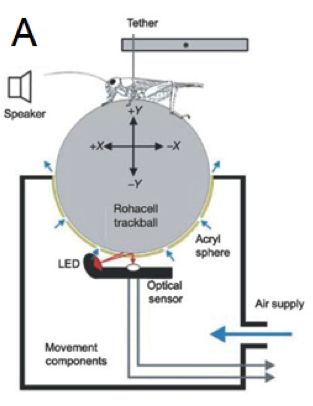 The trackball enables us to suspend a female over rotatable sphere and measure her movement associated with her attempt to move towards a speaker playing a male’s acoustic signal (Figure 2). Using the trackball and associated computer software, we measured how fast a female moved towards the speaker (velocity), how far she moved (total path length), and whether she generally seemed to be attempting to move towards the speaker (net vector score). We found that female age influenced phonotaxis response: older females (13 days post adult moult) moved further and at higher velocities than females in other age groups in an attempt to reach the speaker (Figure 3). Figure 3. How age affects female phonotaxis measures. Letters above each age reveal significant differences. We also found that older females (10-13 days post adult moult) tended to more accurately orient themselves and move towards the active speaker than younger females (1-7 days post adult moult). 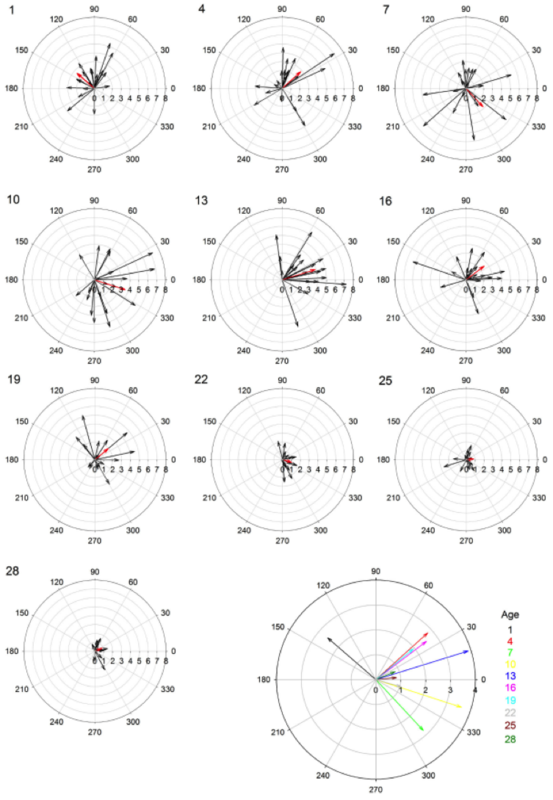 The polar plots below (Figure 4) show the average direction and velocity (red arrows) towards the active speaker (0°) for females across all 10 age groups. Figure 4. Polar plots indicating speed and direction moved for each age group tested. Inner circular gridlines indicate velocity magnitude (cm/s) and tic marks around the outside of the circle represent velocity angle. Red arrows show the mean velocity for all 20 females in each age group. The large, multi-colored plot shows the differences in average velocity across age groups. Overall, we found age influenced female G. assimilis phonotaxis, where middle aged adult females’ (10-13 days old) displayed the strongest phonotaxis compared to younger or older females. The high speed and long distance travelled observed in young females (1-7 day) may signify higher energy reserves9, but their random orientation suggests little interest in the standardized acoustic mate attraction signal. We provide two possible explanations for the young females’ inattention towards the standard mate attraction signal: stronger preferences and lack of maturity. 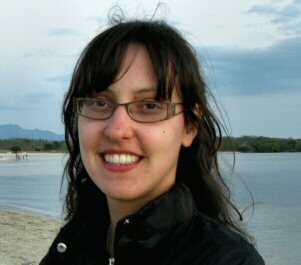 Very young females may have greater requirements in mate selection and prefer more extreme male traits. Alternatively, very young females may be too young to respond to the call because they are not reproductively mature yet. Future research should present young females with multiple male signals to determine if indeed they are reproductively immature or only phonolocating toward signals with extreme trait values. Conversely, the older females oriented toward the speaker, suggesting interest, but walked at reduced speeds and covered shorter distances, possibly indicating senescence. Overall, our findings are consistent with most studies on how age influences mating preference: diminished choosiness with increasing age . Our study suggests 10- and 13-day females are most responsive when quantifying the preference landscape for G. assimilis sexual signals. Andersson, M. 1994. Sexual Selection. Princeton: Princeton University Press. Magnhagen, C. 1991. Predation risk as a cost of reproduction. Trends in Ecology & Evolution, 6, 183-186. Dugatkin, L.A. 1992. Sexual selection and imitation: females copy the mate choice of others. The American Naturalist, 139, 1384-1389. Jouventin, P., LeQuette, B., & Dobson, F.S. 1999. Age-related mate choice in the wandering albatross. Animal Behaviour, 57, 1099-1106. Kodric-Brown, A., & Nicoletto, P.F. 2001. Age and experience affect female choice in the guppy (Poecilia reticulata). The American Naturalist, 157, 316-23. Moore, P.J., & Moore, A.J. 2001. Reproductive aging and mating: The ticking of the biological clock in female cockroaches. Proceedings of the National Academy of Sciences, 98, 9171-9176. Widemo, F., & Sæther, S. A. 1999. Beauty is in the eye of the beholder: causes and consequences of variation in mating preferences. Trends in Ecology and Evolution, 14, 26-31. Solymar, B., & Cade, W.H. 1990. Age of first mating in field crickets Gryllus integer (Orthoptern: Gryllidae). The Florida Entomologist, 73, 193-195. Prosser, M.R. 1994. 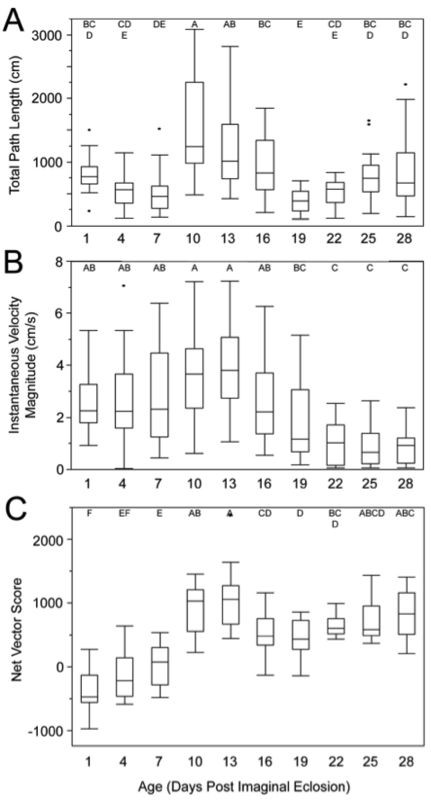 Effect of Age On Female Choice in the Field Cricket, Gryllus integer. Unpublished Masters thesis, Brock University, St. Catharines, Ontario. Hedwig, B. & Poulet, J.F. 2004. Complex auditory behaviour emerges from simple reactive steering. Nature, 430, 781-785. Ryan, M.J., Keddy-Hector, A. 1992. Directional patterns of female mate choice and the role of sensory biases. The American Naturalist, 139, 4-35. Prosser, M.R., Murray, A.M., & Cade, W.H. 1997. The inﬂuence of female age on phonotaxis during single and multiple song presentations in the ﬁeld cricket, Gryllus integer (Orthoptera: Gryllidae). Journal of Insect Behavior, 10, 437-449. Roff, D.A. 1992. The evolution of life histories: theory and analysis. London: Chapman & Hall. Mautz, B.S., & Sakaluk, S.K. 2008. The effect of age and previous mating experience on pre- and post-copulatory mate choice in female house crickets (Acheta domesticus L). Journal of Insect Behavior, 21, 203-212. This entry was posted in Scientific Publications and tagged Acoustic signals, female mate choice, Female preference, Gryllus assimilis, Phonotaxis, Trackball by bertramlab. Bookmark the permalink. We investigate questions that have an evolutionary, behavioural, and evolutionary origins. We often use insects (especially crickets) as our study organism. 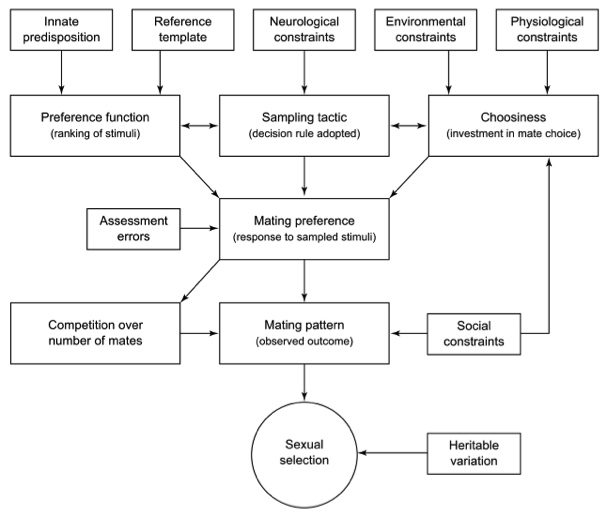 Most of us study questions relating to sexual selection, aggression, mating behaviour, acoustic signaling, sperm competition, nutrition, behavioral physiology, mate choice, and audience effects.